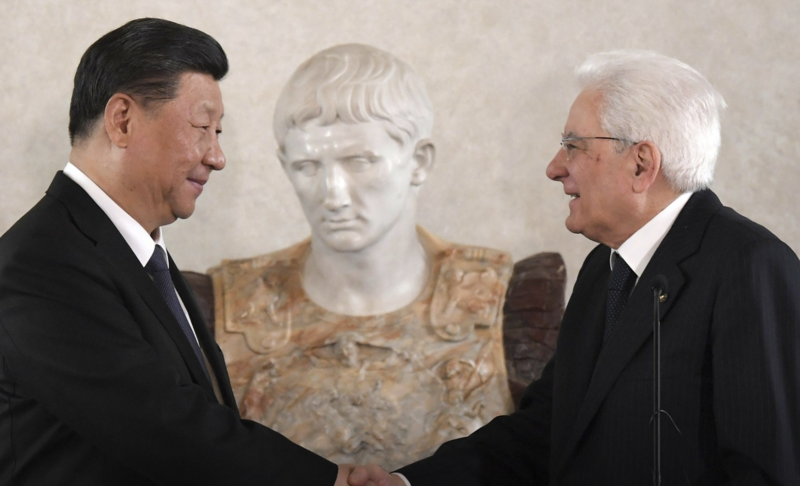 Having brushed aside complaints from Brussels and the US, who fear the already heavily indebted and economically faltering NATO member might be walking into another "debt trap", Italian President Sergio Mattarella welcomed Chinese leader Xi Jinping to Rome on Friday. And after posing for photos, Mattarella and Xi set the table for the expected signing of a Memorandum of Understanding that will make Italy the first EU member and G7 nation to sign on to Beijing's controversial One Belt, One Road initiative (BRI), the AP reports. Of course, the populist Italian government, already on thin ice with the globalist powers after defying Brussels and its fiscal rules by blowing out its budget deficit, didn't exactly smooth over European anxieties by insisting that the partnership with platitudes like insisting that the economic partnership be a "two way street". But Rome has little incentive to cater to Brussels on this. And Beijing, too, has everything to gain. By the end of his two-day diplomatic visit to Italy, Xi will have achieved a major geopolitical victory - a key vote of confidence in one of his signature initiatives - at a time when his government is struggling with slowing economic growth and a destabilizing trade war. While Xi and Italy's leaders are expected to sign the memorandum on Friday, the deal is happening against a backdrop of an increasingly adversarial EU, which just last week declared China an economic rival not to be trusted, as Beijing continues to make inroads in Central and Eastern Europe. 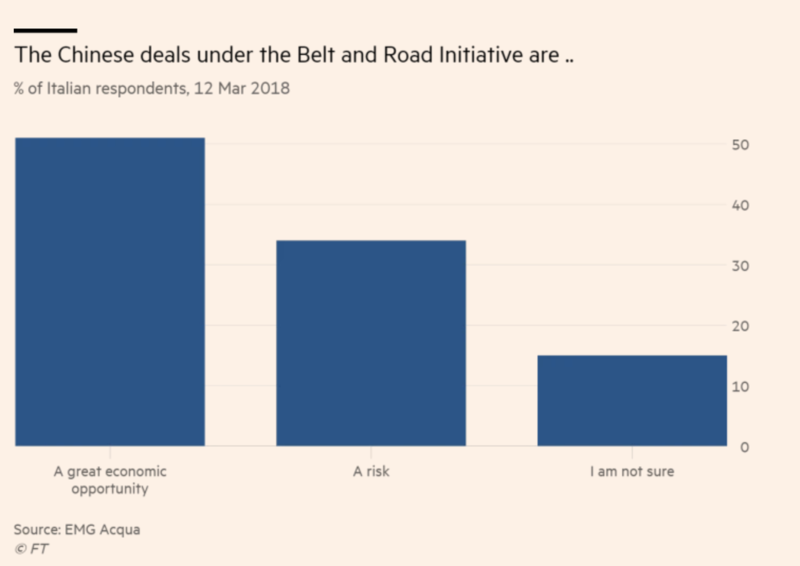 What's more, Xi is expected to leave Rome with billions of dollars in development deals covering everything from business cooperation to soccer. That is making Washington, which has spent much of the last year warning its allies about the treachery of Chinese firms and the threat that they might open a "back door" to Beijing's spys, even more nervous. But even as members of Italy's ruling coalition, not to mention the political opposition, have expressed uneasiness about the deal with China, as the Financial Times pointed out, from a purely economic perspective, closer ties with Beijing could only benefit Rome. The reason? 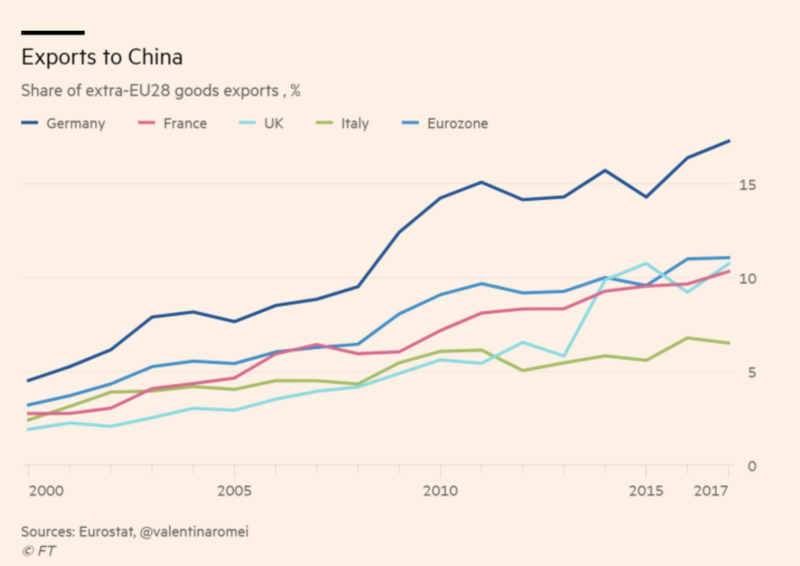 With Italy's economy mired in a recession - one that Europe's central bankers have so far refused to acknowledge - the relationship with Beijing could be an economic boon, at a time when Italy's partners in the EU have offered nothing but disdain. As it stands, Italy's economic ties with China are relatively week. 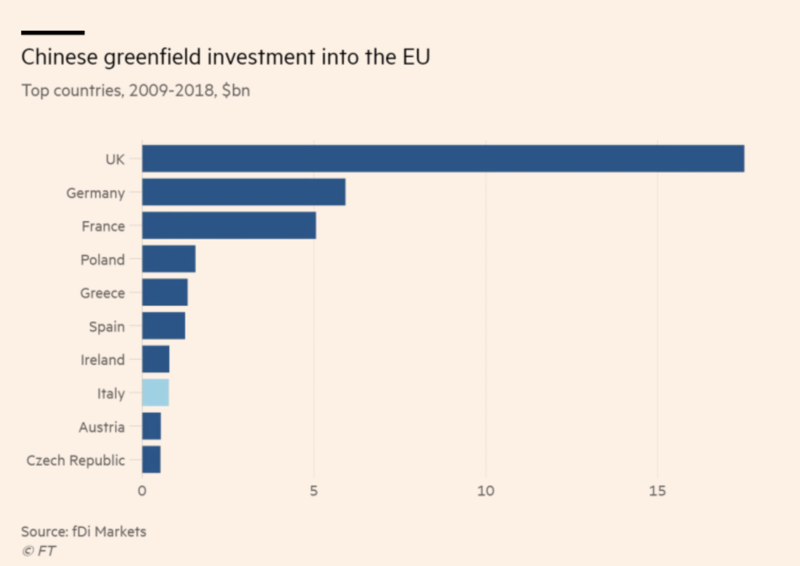 When it comes to FDI, Italy ranks only 76th worldwide in Chinese greenfield investment. 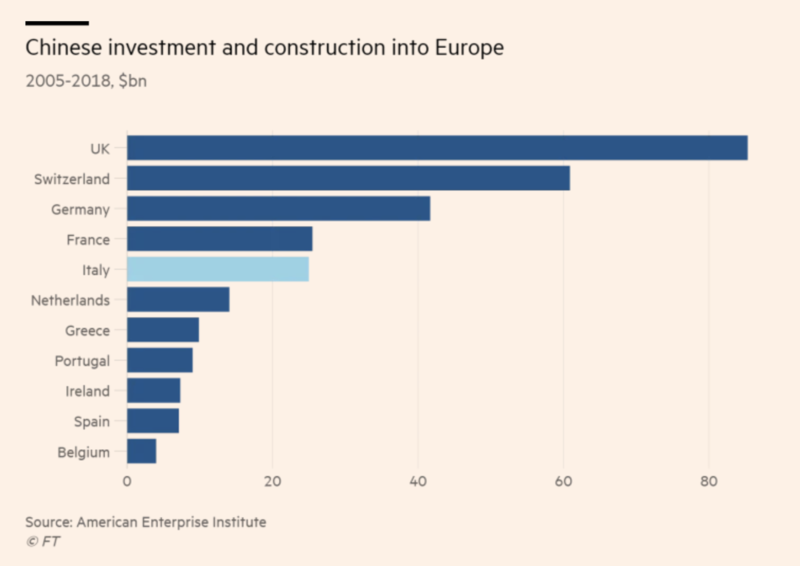 Despite being home to the largest Chinese population in Europe, Italy lags many of its major European partners in overall Chinese investment and construction. Exports of Italian goods to China totaled a paltry $13 billion last year, a figure that was dwarfed by Germany. 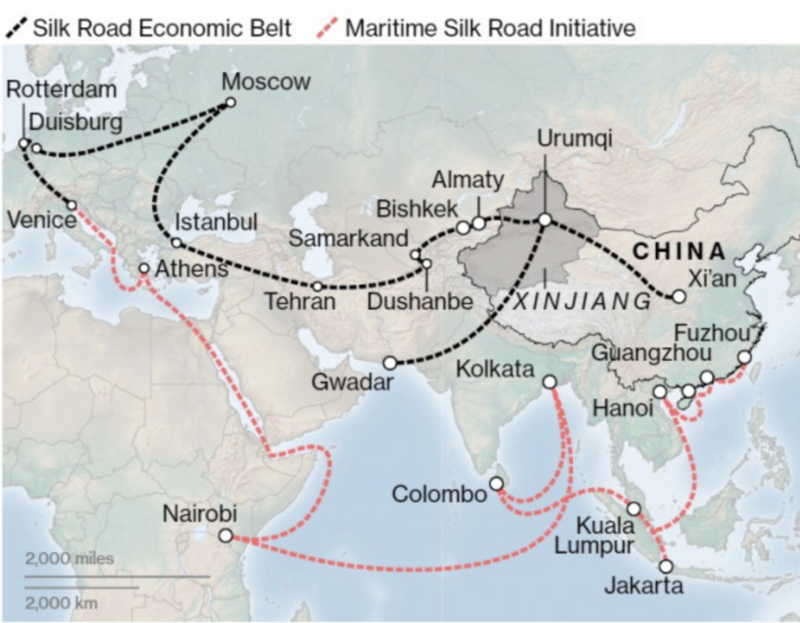 Italy isn't well-connected to China by shipping routes, either, which is probably why Xi has cited improving connectivity and building ports as a key objective of BRI in Italy. According to domestic polling in Italy, most Italians see the deal as an opportunity, while a few still see it as a risk. 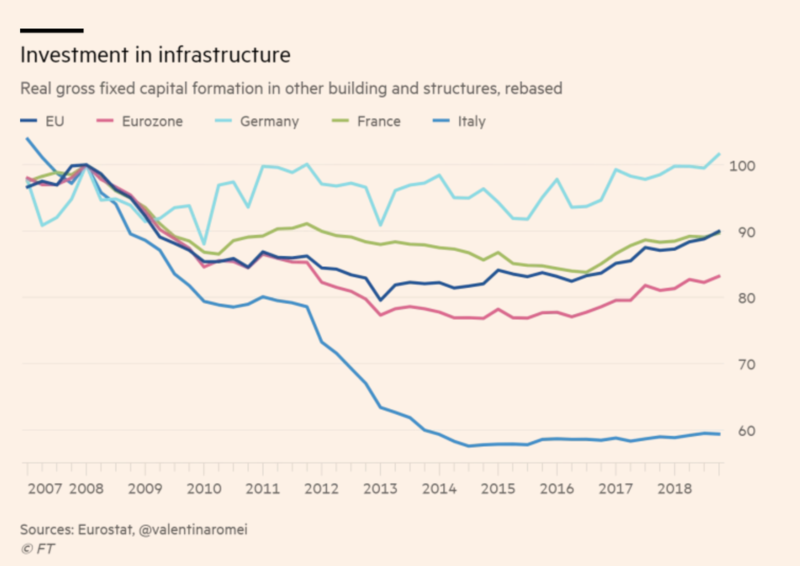 The deadly bridge collapse in Genoa last year raised alarm about the country's aging infrastructure. Still, infrastructure investment has stalled at roughly 40% of its pre-crisis highs. In summary, Brussels might not approve of Italy's deal, but they aren't offering any alternatives to lift the Italian economy out of a recession. And with Italy's economy expected to stagnate in 2019, the MoU is Rome's most obvious lifeline.